Our contributor Francesca Romana presents us with a special double translation: first, Vittorio Messori's article published in Corriere della Sera earlier this week (May 28) in which he presents his (in our opinion disturbing and theologically troubling) view of a kind of diarchical papacy. Antonio Socci, who has been defending this bizarre concept for months, published on the following day (May 29) a reply in Libero. What is going on? Why on earth is probably the most influential Vatican affairs commentator, Messori, raising this matter now? Why, as Socci implies, does he seem to have made a 180-degree turn on the very important matter of "here we rule one at a time." We provide no answers, as it often happens we just wish to bring to English-speaking readers what is being written in other languages but is being overlooked by the mainstream media. We report, you decide. Ratzinger did not withdraw to a private life. Here is why we truly have two Popes. Completely unexpected, said in Latin in a low voice, those words were like a whip that went round the globe in just a few minutes. And also into countries where the majority is not Catholic and not even Christian, but where the historical uniqueness of the event was understood immediately. Let us not forget that - according to the recent words of the Protestant Obama, the Orthodox Putin and the Anglican Cameron - the Roman Pontiff would be today the highest moral authority on the planet. To return to that February 11, 2013, the Feast of Our Lady of Lourdes, those who know the Catholic world are aware that we are still questioning and confronting each other [about it], even harshly. The sides seem to be two: on the one hand there are the guardians of Tradition, for whom the “renunciation” (not demission, the Pope not having anyone on earth to present it to) even if it is foreseen in Canon Law, would be a sort of defection, almost as if Benedict XVI considered his office like that of a president of a multinational or a State. And so, it was necessary he retire to a private life because of declining age, for the sake of issues of efficiency; [he]refused, instead, the long public agony chosen by John Paul II. On the other hand, we have the side of those who are rejoicing: the renunciation would end the sacredness of the Pontiff - that mystical aura surrounding his person - and therefore [there would be] the conforming of the Bishop of Rome to the same norm of all bishops - desired by Paul VI; that is, the renunciation of the governing of a diocese and official appointments in the Roman Curia at the age of 75. In the background, though, there remained questions which seemed to have no answers: why did he not choose to call himself “Bishop Emeritus of Rome” (as the Civiltà Cattolica suggested) rather than “Pope Emeritus” ? Why did he not renounce the white cassock, even if he took off the cape and the annulus piscatorius from his finger, the sign of his ruling authority? Why did he not withdraw into the silence of a cloistered monastery, instead of staying within the confines of Vatican City, next to Saint Peter’s - meeting often – even if in private – with his successor, receiving guests and participating in ceremonies and canonizations like the ones recently of Roncalli and Wojtyla? I must confess I asked myself similar questions - remaining perplexed. A response to these questions comes now from a study by Stefano Violi, esteemed Professor of Canon Law at the Faculty of Theology in Bologna and Lugano. It is worth examining these many pages, since with Benedict’s decision, unknown and somewhat disconcerting scenarios have opened up for the Church. It is probable that the conclusions by Professor Violi will stir up debate among colleagues, seeing that this canon lawyer hypothesizes that Ratzinger’s act is profoundly innovative, and that there really are two living Popes: even if one of them by his own will, – to say it in a simplistic but not wrong way – in our view - “halved himself”. So that we understand: firstly, all of the delirium from conspiracy hunters is to be abandoned, by taking Benedict seriously when he spoke of the growing burden of old age as the prime and only motive for his decision: “[…]strength which in the last few months, has deteriorated in me […] my strengths, due to an advanced age, are no longer suited to an adequate exercise of the Petrine ministry.” However, studying in-depth the very precise Latin with which Joseph Ratzinger accompanied his decision, the eyes of the canon lawyer discovered that it goes way beyond its few historical antecedents and also beyond the discipline foreseen for the “renunciation” in the present Code of the Church. Here then is the reason for his choice, unexpected and innovative, to have himself called “Pope Emeritus.” A bishop remains a bishop when age or sickness obliges him to leave the government of his diocese and so retires to pray for it. More so, for the Bishop of Rome, to whom the munus, the office, and the duties of Peter have been conferred once and for all, for all eternity, by the Holy Ghost, using the cardinals in conclave only as instruments. Here we have the reason for his decision to wear the white cassock, even though bereft of the signs of active government. Here is the reason for his will to stay near the relics of the Head of the Apostles, venerated in the great basilica. 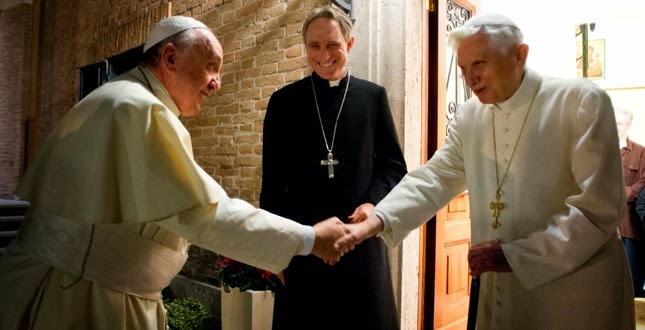 To cite Professor Violi: “Benedict XVI divested himself of all the power of government and command inherent in his office, without however, abandoning his service to the Church: this continues through the exercise of the spiritual dimension of the pontifical munus entrusted to him. This he did not intend renouncing. He renounced not his duties, which are, irrevocable, but the concrete execution of them.” Is it perhaps for this that Francis seems not to be fond of calling himself “Pope” aware as he is of sharing the pontifical munus, at least in the spiritual dimension, with Benedict? Instead, what he has inherited entirely from Benedict, is the office of the Bishop of Rome. Is it for this reason, as everyone knows, this has been his favourite definition, from the very first words of greeting to the people after his election? So much so, that many surprised, asked themselves why he had never used the word “Pope” or “Pontiff” on such a solemn occasion, in front of the televisions of the entire world and spoke only about his role as the successor to the Roman Episcopate. Therefore: would the Church then for the first time, truly have two Popes, one reigning and one emeritus? It appears that this was the will of Joseph Ratzinger himself, with the renunciation of active service only and that it was “a solemn act of his magisterium” to cite the canon lawyer. If it truly is so, so much the better for the Church: it is a gift that they are near each other even physically - one who directs and teaches and one who prays and suffers for everyone, but most of all to sustain his confrere in his everyday pontifical office. Nevertheless he maintains” the munus, the papal office” which “is irrevocable”. He renounced only “its concrete exercise.” Which means that the Church would really have “two Popes” – a diarchy. This revelation is truly sensational. It is a shame that it was already made and commented upon – many times, with plenty of argumentation – three months ago, here in the columns of “Libero” (four installments of my inquiry, starting on February 9). Three months later, Messori and the “Corriere” presented all of it as if it were their own scoop (taking as a pretext one of the essays by a canon lawyer which came out recently), without referring to everything that had happened between February and March. Indeed, my inquiry into the demission of the Pope, a year after the renunciation, caused a great row: and the “Swiss Guards” of Vatican Insider- La Stampa” immediately protested, scandalized. Will Tornielli shudder also this time because of Messori’s article? Last February, such was the horror of the Vatican journalist, investing himself in the role of tutor in the public order of ideas, that he felt it his duty to bother even poor Benedict XVI in order to ask him to deny or confirm my theses – despite knowing well that he had chosen the cloister. In reality, that note was not at all about a diarchy. Primarily his note however, contained a single piece of real news: it was in an enigmatic, exquisite response given by the Pope Emeritus, which by itself, should have made the “insiders” jump up onto their chairs! “La Stampa-Vatican Insider” thought such a surreal answer sounded just right. They were not even aware of the Pope’s sensational irony and how he had elegantly eluded them. It is obvious in fact, that such an answer meant that the Pope could not or did not want to speak nor explain the reasons for that choice. You do not need much to understand it, since the renunciation had also been decided a year before and was announced twenty days prior to it becoming official. Therefore, it is impossible that “at the time of the renunciation” there were no “other clothes” available. Anyone can understand that this statement is of exceptional importance: it means that Ratzinger dresses like a Pope because “he is” Pope. If and how this is possible and what it implies is a completely unresolved question, above all theologically. In fact, last April 7, Sandro Magister, the most authoritative and reliable of Vatican journalists, on his very well-known internet site, recalled my inquiry and the “answer” given by “Vatican Insider” saying that – in his judgment – it did not respond the questions I had raised. The TV had broadcast news of the controversy along with the Pope’s extraordinary note; even the “Corriere della Sera” had (although with a superficial and arrogant article). It is surprising that of all this, in the page of yesterday’s “Corriere”, there was not even the slightest mention. Evidently Messori does not remember his interview of a year ago, precisely with Andrea Tornielli, who never appeared to be enthusiastic about the fact that Ratzinger remained Pope Emeritus. In that interview – spurred by Tornielli’s questions – Messori said he was very perplexed at the fact that Benedict had decided to stay in the Vatican. Is everything just fine then? Is everybody happy? It is exactly the opposite. Messori in fact, as an “insider” – cannot ignore that this situation – as he outlines it – does not have any theological nor canonical foundation. Through the Divine Constitution of the Church, in reality only one can be the Pope. And if it is as Messori says – Benedict XVI “did not intend to renounce the pontifical munus” which “is irrevocable” what kind of demission is his? Messori knows well that his entire article induces one to ask a dramatic question (who is the Pope? ), but he avoids carefully formulating it, allowing the reader to pose it. Why? Is this article a signal that many are posing it in Church circles?